HAVANA, Cuba -- The mojitos were in our hands, and we could see the shimmering blue of the Caribbean.But this was no ordinary island vacation. Television cameras whirred as a group of Americans checked into Havana's stately Hotel Nacional, as history was being made -- by us. Except for a brief period from 2000-2003, this was the first time in 50 years that average Americans could legally visit Cuba. The trip, through Insight Cuba, would highlight Havana, Santiago de Cuba for arts and music, Trinidad on Cuba's southern coast for colonial charm and Pinar del Rio for its rural natural beauty. The group of 30 Americans included a goat farmer, a psychologist, a wine expert, a social worker, an entrepreneur, a hospital administrator, a stock adviser, a lawyer and more. Their common denominator? They were all experienced travelers. They all were fine with the requirement that the trip focus on cultural activities, not beaches or leisure, although one man wistfully asked, "Any chance of playing golf?" So I sipped my mojito and let the August heat seep into my bones. I was excited. And slightly worried about the dour rules of the trip. And also already in love with Havana. 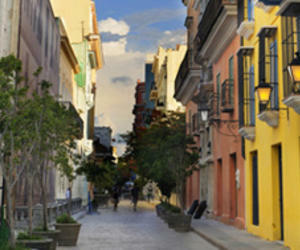 Havana, one of the great Spanish colonial cities of the New World, is like an exotic orchid with a few wilted petals. Fifty years of Communism hasn't been kind to its upkeep, although Old Havana, its fortress, the neighborhood of Miramar and the Revolution Square area are splendid. The city of 2.2 million sprawls cheerfully in all directions, part pastel, part crumbling ruin, elegant in its promise of what was and could be again. In the next few days, we would get the complete tour of the city founded in 1515. But the first order of business was a lecture. At Friendship House -- the Cuban Institute for Friendship with the Peoples -- the group got a warm welcome, then a blunt description of Cuba's suffering because of U.S. policies and "terrorism." Then came a far more nuanced talk by Carolos Alzugaray, a professor and expert on Cuba-U.S. relations, about the complex issues that bind and divide the two countries and the 50-year-old U.S. trade embargo. Journalists, academics and people with family in Cuba have long been able to travel there, but tourism has been off-limits to the rest of Americans, even though 2.5 million tourists from other nations routinely vacation in Cuba each year. Yet times are changing, Alzugaray said: "Cuba is undergoing a major economic transformation. For foreign relations, Cuba is in its best moment." His advice for the U.S.? "If you want to influence a country, you have to be present." That afternoon, the group strolled Old Havana past a hotel where novelist Ernest Hemingway used to hang out, then visited the Leonor Perez maternity home. The home cares for high-risk pregnant mothers, four to a room. It's hot (no air conditioning), but they are used to the heat. Two women, heavily pregnant and carrying twins, talked about their lives. We met a 12-year-old pregnant girl. We asked questions about C-section rates (about 25%), epidural drugs (they use few), and everyone kept smiling and saying "gracias." After that, the group tried to go shopping, but in Cuba there are almost no stores, not much to buy except on the black market -- and spoilsport U.S. regulations allow Americans to bring back nothing except literature, artwork or music. That's right -- no cigars, no rum, no panama hats. In the evening, the group got a last-minute invitation to a concert in honor of Fidel Castro's 85th birthday, held at the Karl Marx Theater. Four hours, no intermission! Fidel did not attend. We did. After that, it was dark, and Carnaval, which is held in August in Cuba, was rocking the Malecon promenade near the hotel. Thousands of people were mingling, dancing, swarming. The thumping beat lasted long into the night. A retired social worker in our group, Betsy Blades of Baltimore, met a British tourist. The woman was astonished to meet an actual American. "Do they know you're here?" she asked, as if Blades might have dropped in by parachute. But it was not a totally strange question. Americans have come illegally to Cuba for years -- but it is getting harder to do that. On this trip, many in the group asked that their passports be stamped as they went through Cuban customs. There was Revolution Square -- which looks a bit like a Walmart parking lot surrounded by government buildings. There was the impressive José Marti memorial that honors the father of Cuban independence from Spain. At the memorial art gallery, every photo and painting was of Fidel Castro. In the evening, the destination was the Fortress of San Carlos, the enormous defensive fort built by the Spanish in 1774. On the hot night with the moon rising, soldiers in 18th-Century uniforms set off a cannon shot that echoed all the way across to the twinkling Havana skyline. Before we left town, there was more to see. There was the Rum Museum, where tourists had a shot of "Cuban breakfast." There was the Revolution Museum, which includes everything from Castro's boots to the typewriter of a New York Times reporter who covered the conflict. The museum also displays pieces of an American B26 shot down in 1961 and a turbine from a U2 spy plane shot down during the Cuban Missile Crisis of 1962 -- somewhat uncomfortable for Americans. Gradually, though, some participants started flagging at the busy tour pace. Some skipped dinner and found their own meals. Some went to Carnaval in the evening and got conned. Some sank into the sofa cushions on Hotel Nacional's wide veranda and smoked cigars. Some wandered around town on their own to take photos. One went to a Cubacell store to buy a cell phone that could call New York. Americans are not all that good with group travel. Too independent. But as the pieces of the trip all merged together and we stuck with it, it was clear we had gotten a very decent introduction to a piece of Havana's heart. Now we were ready to head out of town to Pinar del Rio, a rural province to the west. Next week: Nature, a party, a farmer.